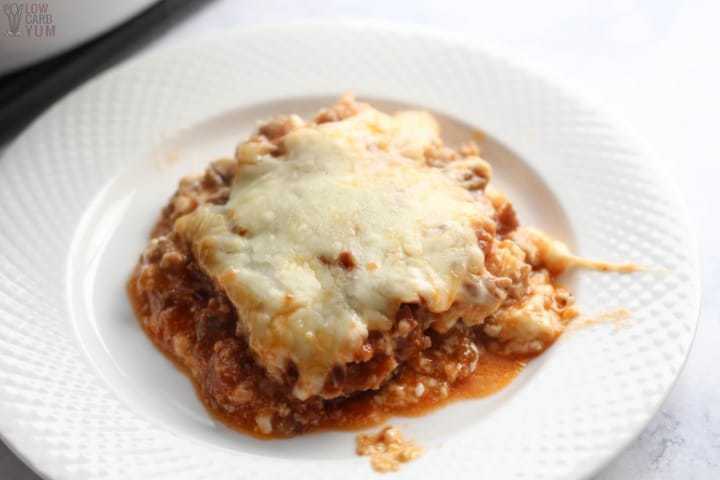 This low carb eggplant parm lasagna casserole combines the tastes of two popular dishes. It makes a very delicious and filling meal. 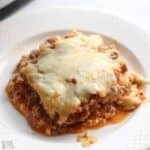 This is an easy Italian style casserole that tastes like a cross between eggplant parmesan and lasagna. I used hot Italian sausage and sliced it up after it was cooked. You can use either bulk or link sausage in mild or hot. 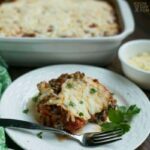 I thought the spicy sausage gave this low carb eggplant parm lasagna casserole a nice flavor. My eggplant was just picked fresh out of the garden. If the eggplant is store bought, you may want to salt it and let it sit in a colander to remove any bitterness. And, you can remove the skin if desired. I’ve been finding all sorts of delicious ways to cook up eggplant. 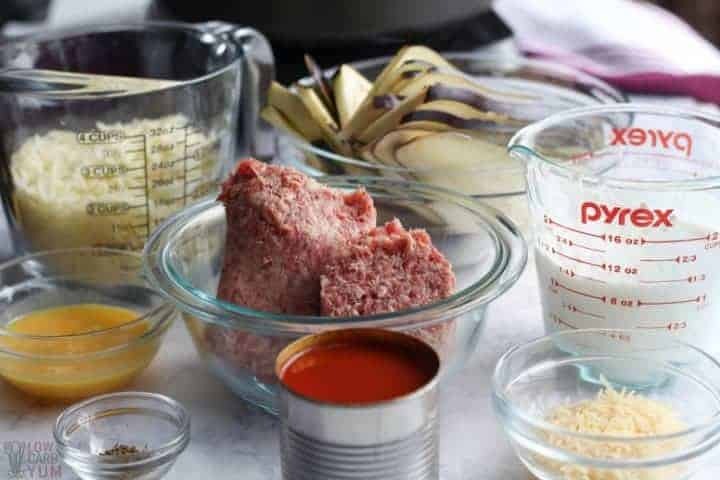 A few of my favorites, including this low carb eggplant parm lasagna casserole, are in this recipe collection. 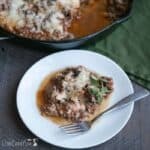 Eggplant Parmesan Casserole is another great dish that can easily be made low carb using a pork rind based breading. What’s your favorite way to cook eggplant? 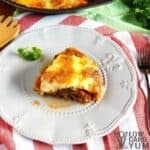 How Many Carbs are in Low Carb Eggplant Lasagna? 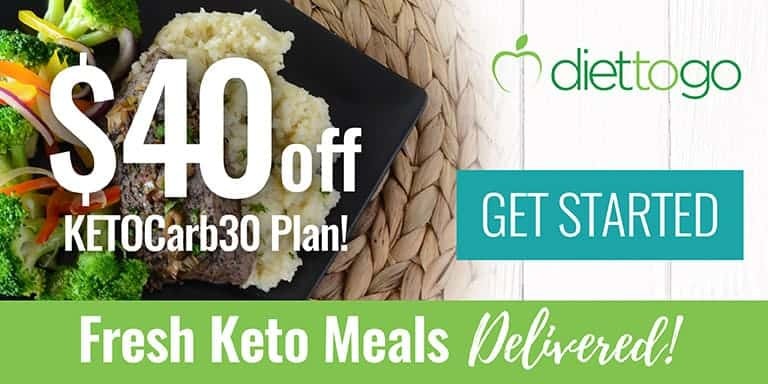 For our version there are 376 calories, 22 g of protein and just 7 grams of carbs! 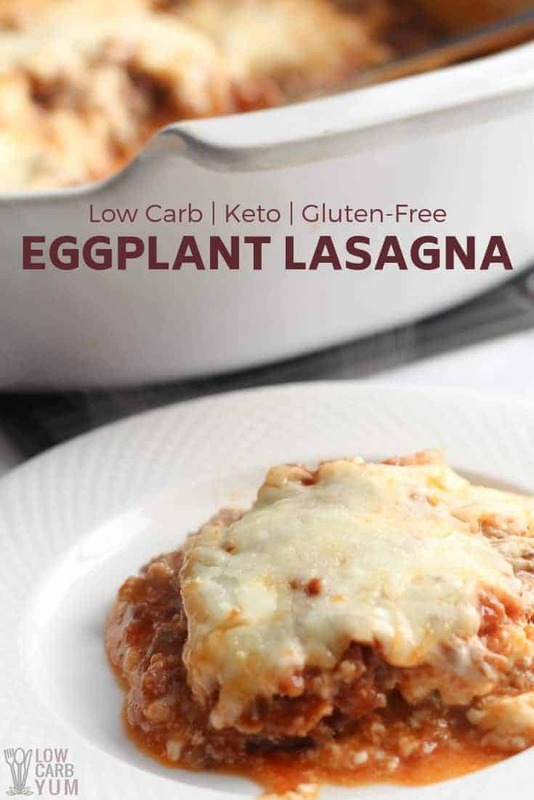 These numbers can fluctuate depending on the ingredients that you decide to use in your version of this low carb eggplant lasagna recipe! In short, the answer is YES! Just one cup of eggplant contains 20 calories, 4.8 grams of carbs (2.9 being sugar), 1 g of protein and 3 g of fiber. Eggplant is high in antioxidants and fiber while being low in calories! 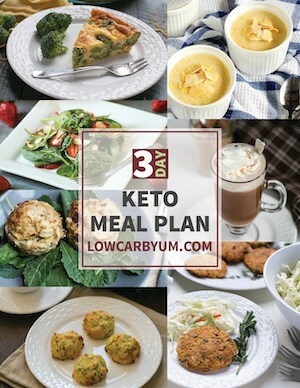 It’s a great addition to any keto diet. But there are a variety of substitutions that can be made within this recipe if you’d like to change it up. To start with, the sausage can be any heat level your family enjoys. You can also use chorizo or hamburger. And although eggplants were used, other low carb vegetables like spinach would work as well. Layering thin slices of zucchini works too! Also, if you don’t have cottage cheese or not a fan, you can replace with Ricotta cheese. 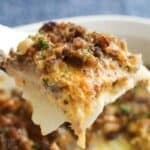 I use either cheese in my lasagna recipes. To get started on the recipe, I first preheat the oven to 350°F. Then, I cook up my sausage in a skillet, remove from heat, and mix in tomato sauce into cooked sausage. While the meat is cooking, I’ll slice the eggplant lengthwise into thin strips. The slices are then fried in a little oil until brown and softened. A layer of the cooked eggplant is then placed at the bottom of an 8×8 baking dish. 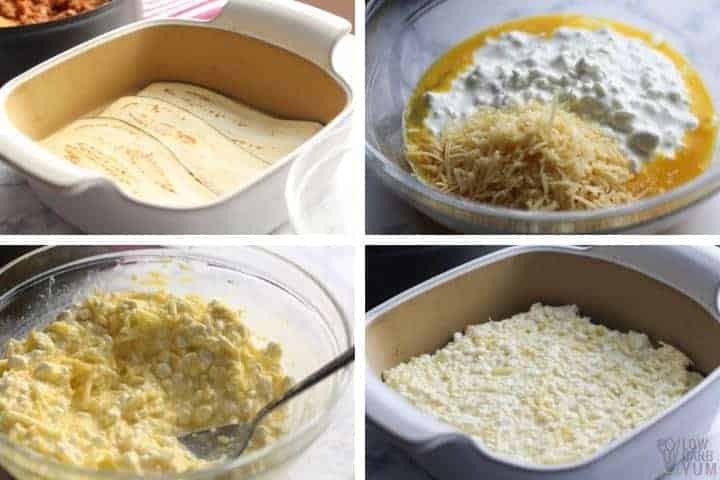 The cheese mixture is prepared next by mixing egg with cottage cheese, parmesan cheese, and 1/4 cup of the mozzarella cheese. This mixture is then spread over the eggplant. Next, the sausage mixture is spread over the cheese. A little oregano is sprinkled over the sausage layer then it’s all topped off with the remaining mozzarella cheese. 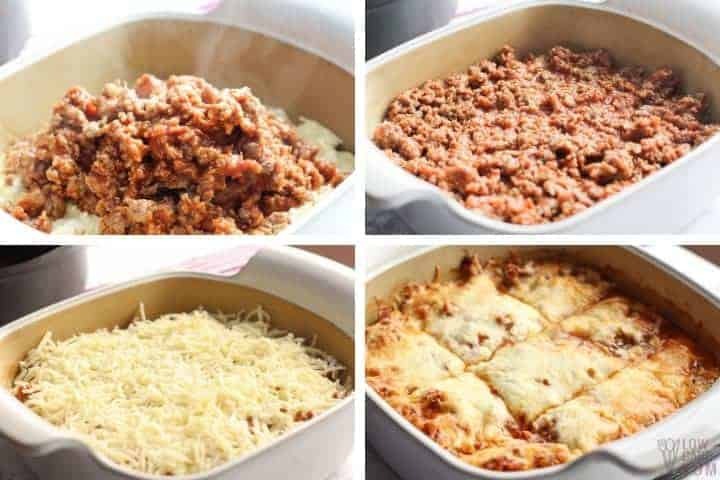 The layered dish is then popped into the preheated oven and bake for about 30 minutes or until cheese has browned on top. Whenever I am making a casserole dish that is topped with cheese, I love to finish the dish off with something green. For this low carb eggplant casserole, I topped it off with some fresh basil. If you have parsley on hand, that will work too! 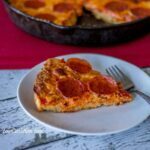 This is a nice comforting meal that your family is sure to enjoy. Be sure to leave a comment if you do give it a try to let us know how it turned out. 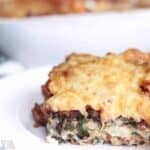 This low carb sausage, eggplant, and cheese casserole tastes like a cross between eggplant Parmesan and lasagna. It makes a very delicious and filling meal. 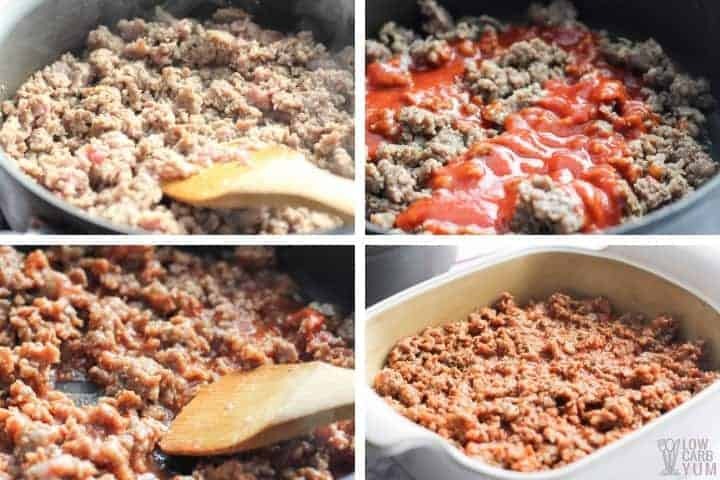 Preheat oven to 350 degrees F. Mix tomato sauce into cooked sausage. Set aside. Slice eggplant lengthwise into thin strips. Fry eggplant slices in a little oil until brown and softened. Line bottom of an 8×8 baking dish with cooked eggplant. Mix egg with cottage cheese, parmesan cheese, and 1/4 cup of the mozzarella cheese. Spread cheese mixture over eggplant. Layer the sausage mixture over the cheese then sprinkle oregano over it. Bake in 350 oven for about 30 minutes or until cheese has browned on top. TIP: There are a variety of substitutions that can be made within this recipe. To start, the sausage can be any heat level your family enjoys. You can also use chorizo or hamburger. TIP: Although egg plants were used, other low carb vegetables like spinach would work as well. 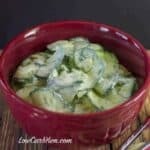 Layering thin slices of zucchini would work too! TIP: If you don't have cottage cheese or not a fan, you can replace with Ricotta cheese. Post updated in February 2019. Originally published August 2010. Great, easy recipe. I double-decked it, so more like a lasagne, and put a layer of baby spinach in the middle. Added basil, and red pepper flakes, and used a meatloaf mix for the meat. Also added a little double cream to the sauce… I’m inspired by your recipes. Been doing Keto for just three months with terrific results (61 y.o. guy, lost 16 lbs in that time). 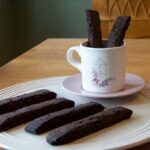 Happy to follow your recipes! Sounds delicious! Thanks for the support! It was delicious! This was the first recipe that I tried. I gave some to my daughter and she also loved it. I’ve never used cheddar in lasagna so now I’m curious to see how it tastes. I’m glad your husband enjoyed it too. 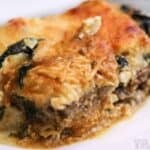 This was so delicious, I made it with Ground lamb! Best ever. Don’t need pasta. Excellent recipe. Got a rave review from non-low-carb nephew. I used the long, skinny Chinese eggplant as it seems to have a milder taste. And no matter what kind of eggplant, I always salt it and let it drain for at least a half an hour before rinsing and baking. I got about a half a cup of water out of the amount of eggplant used for this recipe. It browns faster in the oven and doesn’t make the casserole soupy. I agree! Salting the eggplant not only removes the excess liquid but it helps get rid of any bitter taste. Thanks for the tip! Is there is vedeo for eggplant lasagna ? How we should brown eggplant first ? I find it easiest to brown it in the oven. You can fry it in a pan, but baking is less messy and quicker. Is there is any video for this . There is a video of this recipe in the post. 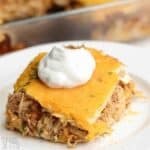 I don’t eat pork or beef, would ground turkey work for this recipe? It’s at the bottom of the post. Do you know the fiber content? Looks delicious, can’t wait to try it! It’s about 3 grams. Some of the other numbers seemed off so the data has been updated. How do you give out macros per serving when using “medium sized eggplant” as a measurement? Could you give a weight at least? A medium eggplant is a little over 2 pounds. How many servings total are in the recipe? There’s 9 servings. Added that information to the recipe. 9 servings. Info has been added. I made this early. Thank you for the recipe. My picky-eater son ate it too. Happy Mom here.